I'd like to introduce Graham Christmas. Graham is a fellow Institute of Advanced Motorists member, Aprilia Tuono V4 and GSX-R owner, keen on trackdays and also enjoys mountain biking. 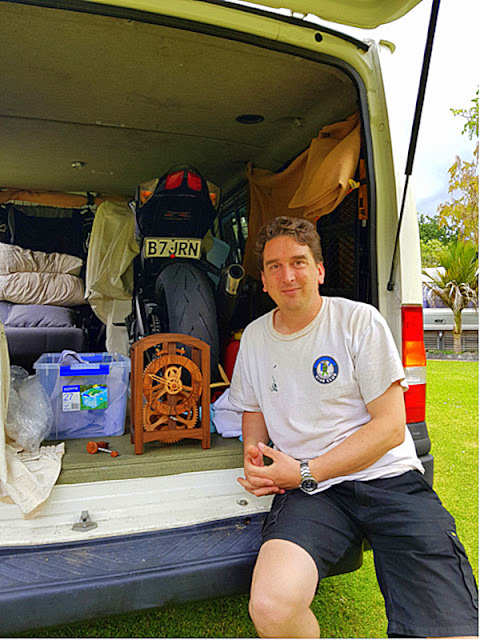 Apart from our motorcycle connection, Graham is a qualified cabinetmaker and a master craftsman. Both Jennie and I love all forms of art that uses traditional skills, irrespective of the medium used - painting, pottery, metal or wood etc. It would a tragedy if these skills die out and we have a few original one-off pieces of art in several types of media. My pride and joy is the Damascus Steel carving knife shown HERE . 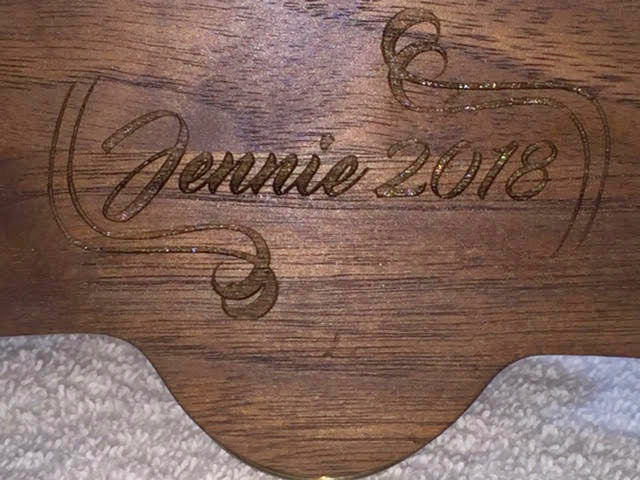 Jennie's birthday is at the beginning of December and back in August, I asked her what she wanted as a present. "Dunno" she says, "But as I'm buying new bike suspension for your birthday, mine better be good". The onus was clearly on me with that shot across the bows! All sorts of things were briefly considered and rejected for various reasons but one stuck. 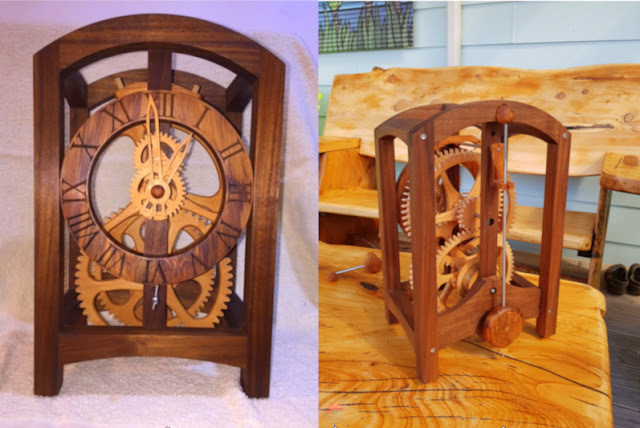 Graham is multi-talented and makes anything which requires high level cabinetmaking skills. Ages ago, Jennie had seen the photo of a wooden skeleton free-standing clock which Graham made and fell in love with it. 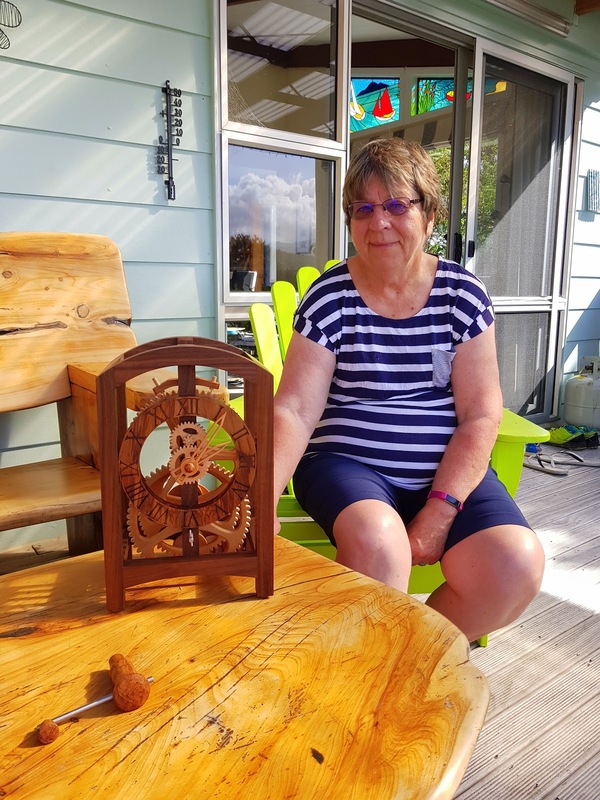 Why not talk to Graham and see if he would make her a skeleton mantle clock to go on our dining room sideboard which is made from solid rimu timber? A quick email to Graham and the answer was a very positive "yes"! Then came the drama of figuring out a design which would please Jennie without raising suspicions. Fortunately, we've been together long enough to know that she loves clean, simple art, very much in the Japanese taste. More emails and sketches followed and a basic design was settled on. 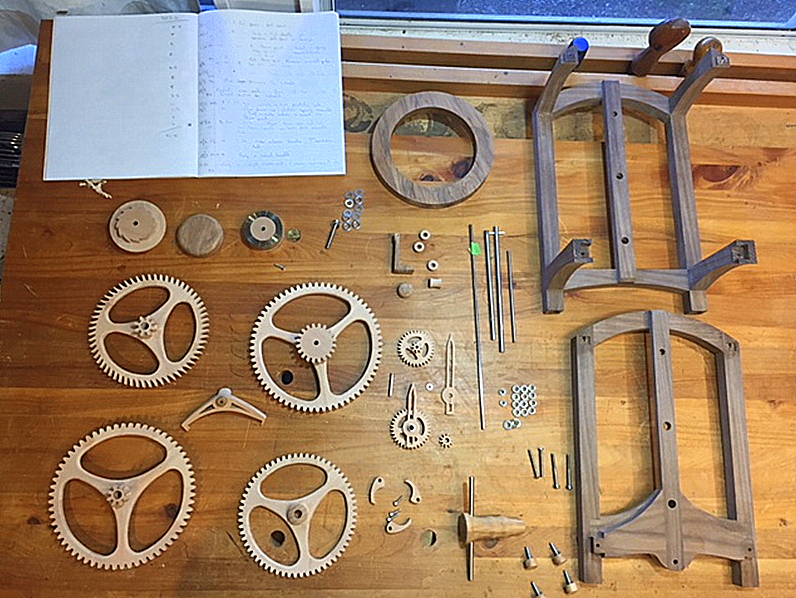 The frame was to be made in walnut, the gears from beech and the clock dial from NZ heart rimu. 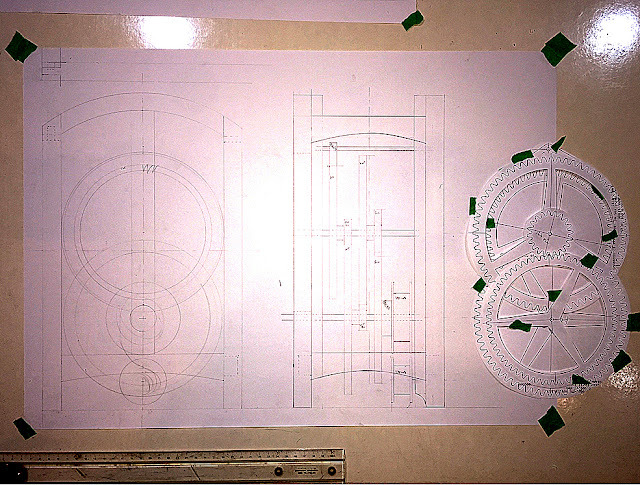 Graham then got stuck into the detailed design calculations. One problem was that Jennie and I have joint accounts and I didn't want to face a grilling on expenditure so Graham graciously offered to let me make full and final payment on her birthday. However, I sneakily withdrew small amounts of cash and sent them to him to cover material costs. Jennie admitted later that she did indeed monitor our accounts to see if she could get an inkling as to what was going on but she failed to spot anything! Haha - 1-0 to me! 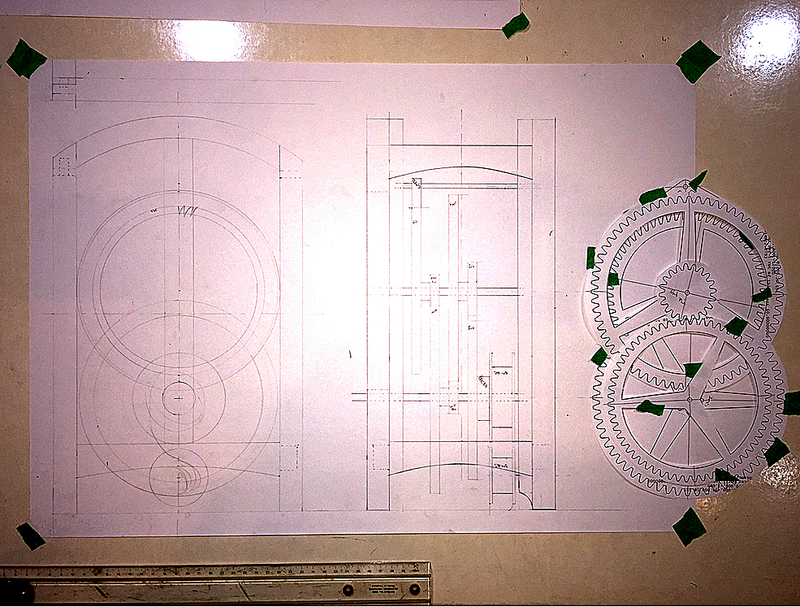 As Graham was building the clock, he kept photos of the construction so that he could put the story of the construction together as an electronic presentation to Jennie as part of its history over the years to come. I also made a booklet of the emails between Graham and me so she could see all the discussions, not to mention deviousness which went into getting the final result! A couple of weeks ago, got a call from Graham that the clock was ready and as he was going to be just a couple of hours from where we lived doing a trackday and some downhill mountain biking, would I like to meet him and pick up the clock? Going on the bike posed a problem in transporting the clock. Going in the car needed a story to stop Jennie coming along for a ride! Not exactly telling lies but being economical with the truth, so to speak! Me: "Honey, I'm off in the car to meet an IAM mate (true) to talk about the upcoming training course (untrue)". Jennie: "Why aren't you taking the bike?" Me: "Don't want to risk another puncture on a quick trip and besides, I have all these training course notes to carry" (brandishing a heap of IAM documents lifted from my cupboard in anticipation of difficult questions). Haha, 2-0 to me! I've already got permission to replace the bike next year so I was simply happy to help make Jennie's day a memorable one as opposed to using up brownie points with a heap of grovelling! What a fantastic present mate. You do know your wife very well, Jenny looks chuffed. Graham must have a lot of patience to carve those intricate pieces out thats for sure. A lot of time and skill has gone into that clock. Hint at a new bike eh? Triumph? Bloody, spelling auto correct made a nonsense of my first reply. Thanks mate, scored maximum brownie points for that pressie - well in the good books for a day or two 😁. Graham was a dream to work with, lovely to find someone with those skills. That's where the traditional skills come in! 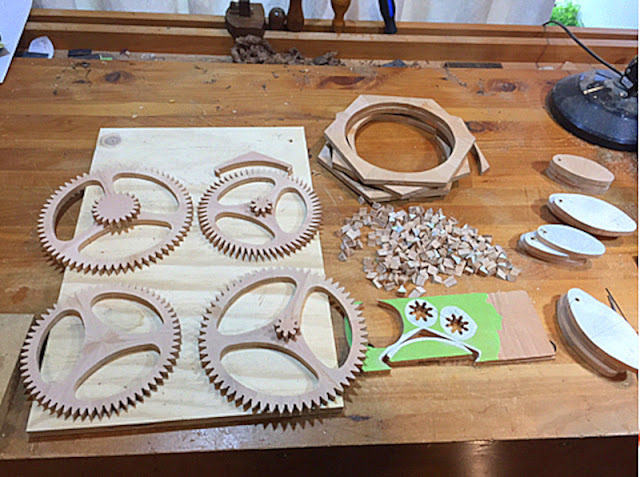 We have photos of the gears being laminated and cut. I've never seen a wooden bike but at the place in NZ's south island which houses Burt Munro "World's Fastest Indian", there is an all-wood working internal combustion engine! You crafty bugger! Great present and what amazing workmanship there Geoff. Graham is obviously a great bloke, what with the motorcycling/mtbing, let alone the woodworking skills! I will be checking out his website. Yep, both the Christmases are fantastic people. Tessa is IAM National Secretary and rides a very nice GSF 1250 S.
Hey Dave, a quick p.s. Do you fly into Wellington? That's where Graham lives and their place backs onto a mountain bike park :-) . Hey Geoff, no we don't do that any more. The NZ based crews do that flying now. We do the (very) occasional Auckland (over and back same day) or Christchurch ferry for maintenance. That's some pretty cool woodwork there - my form 3 skills are probably not quite up to it. That's about my level too. I'm passable on fences but that's about it! Wow, what a nice piece of work. Certainbly worth a few brownie points in the James' household, I'm sure. I'm in awe of true artisans, no matter what medium they work in. If so I need the name of the clock maker. Why Geoff you old romantic you! I'll bet you scored major points, that clock is absolutely amazing though and I'm very much in awe of people with skills like that. Haha! Thanks Andrew, I've been under intensive training for the last 46 years! Totally agree with your sentiments. 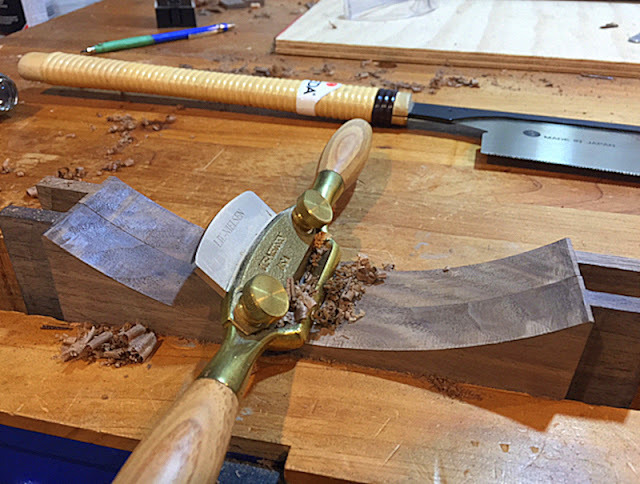 Hanging onto those traditional skills in the face of technology is a special thing and a privilege to see. Every good wish for the festive season!